This phospho specific polyclonal antibody is specific for phosphorylated pS20 of human myosin light chain. Reactivity with non-phosphorylated human myosin light chain is less than 1% by ELISA. The selected peptide sequence used to generate the polyclonal antibody is located near the amino terminal end of the polypeptide corresponding to the smooth/non-muscle form of myosin regulatory light chain found in cardiac myocytes in addition to smooth and non-muscle cells. This sequence differs from that of the sarcomeric/cardiac form of myosin regulatory light chain that has a different sequence around the phosphorylation site. BLAST search analysis was used to determine that the smooth and non-muscle forms of myosin regulatory light chain have identical sequences. Cross reactivity is expected. Human Myosin Light Chain phospho peptide corresponding to a region of the human protein conjugated to Keyhole Limpet Hemocyanin (KLH) - KKRPQRAT(pS)NVFAMFD (aa 12-27). This antibody was affinity purified from monospecific antiserum by immunoaffinity purification. Antiserum was first purified against the phosphorylated form of the immunizing peptide. The resultant affinity purified antibody was then cross-adsorbed against the non-phosphorylated form of the immunizing peptide. Our Abpromise guarantee covers the use of ab2480 in the following tested applications. ICC/IF Use a concentration of 2.5 µg/ml. WB 1/1000 - 1/5000. Predicted molecular weight: 20 kDa. We recommend using BSA for blocking when using phospho-specific antibodies. Trichloroacetic acid was used for tissue fixation. Myosin regulatory subunit that plays an important role in regulation of both smooth muscle and nonmuscle cell contractile activity via its phosphorylation. Implicated in cytokinesis, receptor capping, and cell locomotion. Smooth muscle tissues and in some, but not all, nonmuscle cells. Phosphorylation increases the actin-activated myosin ATPase activity and thereby regulates the contractile activity. It is required to generate the driving force in the migration of the cells but not necessary for localization of myosin-2 at the leading edge. After washing, a 1/5,000 dilution of anti-rabbit HRP (ab7090) was used as secondary. IHC-P of ab2480 at 2.5 µg/ml staining both vascular and myometrial smooth muscle cells of the uterus. The image shows localization of the antibody as the precipitated red signal, with a hematoxylin purple nuclear counterstain. Immunohistochemistry (PFA perfusion fixed frozen sections) - Anti-Myosin light chain (phospho S20) antibody (ab2480)Image from Tao Shijie et. al., Development 136, 1327-1338 (2009), Fig 7G. ab2480 staining Myosin light chain (phospho S20) in Xenopus laevis embryos by immunohistochemistry (PFA-perfusion fixed frozen tissue sections). The tissue sections were fixed in 2% TCA for 30 minutes and washed with PBST (PBS+0.3% TritonX 100) for 30 minutes. Samples were then blocked in 10% normal goat serum (NGS) for 1 hour at room temperature and incubated with the primary antibody. A Cy5 labelled Goat polyclonal to rabbit IgG was used as secondary. The arrows shows that depleting E-cadherin does not have any effect on the expression of apical pMLC. Immunocytochemistry/ Immunofluorescence - Anti-Myosin light chain (phospho S20) antibody (ab2480)Image from Barnhart EL et al., PLoS Biol. 2011 May;9(5):e1001059. doi: 10.1371/journal.pbio.1001059. Epub 2011 May 3. Fig 6.; May 3, 2011 PLoS Biology 9(5): e1001059. Immunofluroescence analysis of Nicaragua cichlid (Hypsophrys nicaraguensis) keratocytes, staining Myosin light chain (phospho S20) (green) with ab2480. Cells were cultured on intermediate adhesion strength surfaces and extracted with 4% PEG and 1% Triton X-100 in cytoskeleton stabilizing buffer. Cells were blocked with PBS-BT for 5 minutes, and then incubated with primary antibody diluted in PBS-BT. Cells were then fixed with 4% formaldehyde in PBS for 10 minutes. Publishing research using ab2480? Please let us know so that we can cite the reference in this datasheet. Do you have any myosin light chain antibodies that detect both the phosphorylated and non-phosphorylated bands on a western blot? I have ab11082 which someone told me is able to detect both bands, but I have had no success so far. The best I can do is blot with ab11082 and then with ab2480 to get the phosphorylated band, but I am wanting to compare the bands and would prefer just one antibody for accuracy. Are you looking for a specific light chain (i.e. 2 or 3)? We only have 2 other anti-myosin light chain antibodies as ab97891 and ab88726 but we don't have any WB images showing 2 bands for phopsho and unphosphorylated protein. You may have to do a WB with a phospho-specific antibody if you want to see clear distinctions between phosphorylated and total proteins. 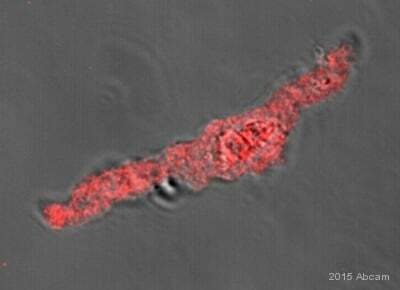 what means you found that this antibody doesn't cross react with cardiac isoform? You are correct that Abcam has not specifically tested cross reactivity of ab2480 with skeletal muscle isoform MLC. This cross reactivity is predicted based on similarity of the immunogen sequence to skeletal muscle MLC. Likewise, ab2480 has not been tested for reactivity to cardiac MLC but the immunogen sequence does not exist in the cardiac MLC. the S is at position 15. 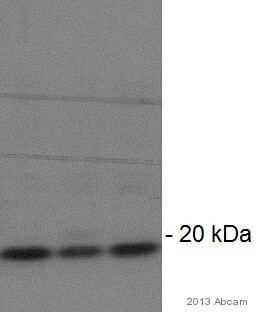 There are some notes regarding cross reactivity of this antibody under the Specificity section of the online datasheet. The notes state that cross reactivity of this antibody to smooth and non-muscle forms of myosin regulatory light chain should be detected. However there will be no cross reactivity to the cardiac form of myosin regulatory light chain.